Peripheral T-cell lymphoma (PTCL) is associated with poor prognosis, particularly in patients with relapsed/refractory (R/R) disease. Pralatrexate, a folate analogue inhibitor, was the first drug approved to treat R/R PTCL. As the distribution of PTCL subtypes differs between populations and few patients in the pivotal trial of pralatrexate were Asian, this study investigated the safety and efficacy of pralatrexate as monotherapy in Chinese patients with R/R PTCL. In this single-arm, open-label, multicenter study, 71 patients with R/R PTCL (median [range] 2 [1–14] prior systemic treatments) were recruited from 15 centers in China and received pralatrexate IV 30 mg/m2/week for 6 weeks in 7-week cycles (with vitamin B12/folate). The primary endpoint was objective response rate (ORR) per central review (null hypothesis: ORR < 15%). The study’s primary objective was met: ORR (95% CI) was 52% (40–64%) (p < 0.001) and responses were observed across pre-specified patient subgroups. Median (95% CI) duration of response was 8.7 (3.3–14.1) months and first response was observed in Cycle 1 for most (84%) patients. Median (95% CI) progression-free survival and overall survival was 4.8 (3.1–8.1) months and 18.0 (10.4–NA) months, respectively. The most common treatment-emergent adverse events were stomatitis (68% [Grade 3/4: 20%]), anemia (49% [Grade 3/4: 24%]) and alanine aminotransferase increase (41% [Grade 3/4: 4%]). These results demonstrate that pralatrexate may represent a promising treatment option for Chinese patients with R/R PTCL. The ORR of 52% compared favorably with prior studies of pralatrexate in other populations and there were no unanticipated side effects. Xiaonan Hong and Yuqin Song are joint first authors. Pralatrexate may be a promising treatment option for R/R PTCL in China; the ORR of 52% was favorable, and exceeds reports in other populations. Pralatrexate was associated with a manageable safety profile, and no unanticipated side effects were seen in Chinese patients with R/R PTCL. Peripheral T-cell lymphoma (PTCL) is a heterogenous disease that includes numerous subtypes of mature T-cell and natural killer (NK)-cell cancers [1, 2, 3]. The incidence of PTCL varies globally, and while approximately 10–15% is made up of non-Hodgkin’s lymphoma (NHL) in Western populations, PTCL is more common in Asia [3, 4]. In China, for example, mature T-cell and natural killer-cell cancers are reported in 23–30% of NHLs [5, 6]. 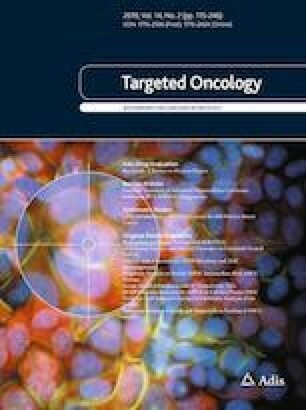 The distribution of PTCL subtypes also differs between populations, including a higher incidence of Epstein-Barr virus-associated extranodal NK/T-cell lymphoma (ENKTL) of the nasal type, adult T-cell leukemia/lymphoma (ATL), and a lower incidence of enteropathy-associated T-cell lymphoma (EATL) in Asian compared with Western populations [1, 4]. Population differences in the other main subtypes of PTCL, including anaplastic large cell lymphoma (ALCL), angioimmunoblastic T-cell lymphoma (AITL), and PTCL not otherwise specified (NOS), appear to be less pronounced . The prognosis for patients with PTCL is poor. 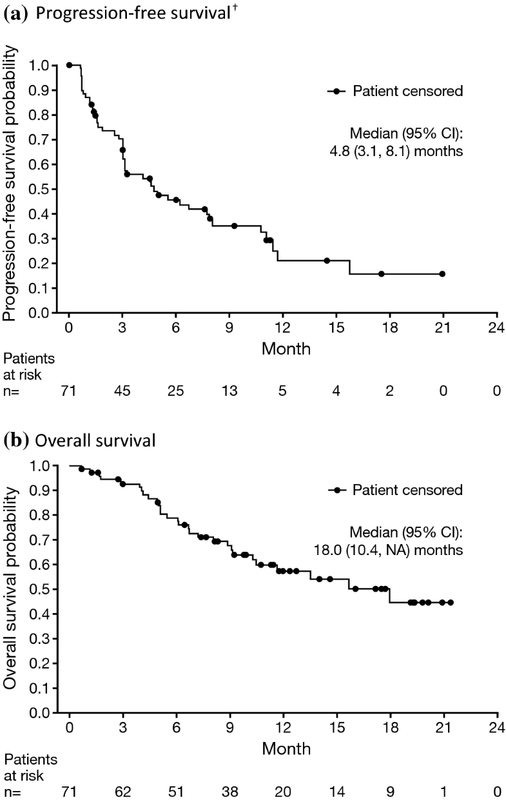 Across all patients there is a 5-year overall survival (OS) rate of 39%, although outcomes vary according to PTCL subtype . Treatment guidelines recommend front-line treatment with anthracycline-containing regimens for patients with PTCL subtypes other than ENKTCL [8, 9, 10]. Brentuximab vedotin was also recently approved with chemotherapy for first-line CD30 + PTCL following data from the ECHELON-2 Phase III trial . However, most patients are either refractory to initial therapy or relapse despite consolidative autologous stem cell transplantation [12, 13]. At present, treatment options are limited for many patients with relapsed/refractory PTCL, and a median OS of just 6 months is reported following relapse or progression in patients treated with chemotherapy . Targeted treatments have improved outcomes for some patients with relapsed/refractory PTCL, and include brentuximab vedotin and the histone deacetylase (HDAC) inhibitors belinostat and romidepsin [15, 16, 17]. In addition to these US Food and Drug Administration (FDA)-approved agents, the HDAC inhibitor chidamide has been approved by the China Food and Drug Administration (CFDA) for use in this setting [18, 19]. Pralatrexate is a folate analogue metabolic inhibitor that has high affinity for the reduced folate carrier, which is highly expressed in malignant tissue, and folylpolyglutamate synthase, which converts pralatrexate to its polyglutamated form to increase intracellular retention . Single-agent pralatrexate was the first drug to be approved by the FDA in 2009 for relapsed/refractory PTCL based on data from the PROPEL study, which recruited predominantly White and African-American patients . While the efficacy of pralatrexate was demonstrated in Japanese patients in a recent Phase I/II study, there are limited data in other Asian populations . The aim of this multicenter, single-arm trial was to investigate the efficacy and safety of pralatrexate in Chinese patients with relapsed/refractory PTCL. Patients aged ≥ 18 years were recruited from 15 hospitals in China into this confirmatory, Phase III, single-arm, open-label study, which was conducted between September 2015 and July 2017 (ClinicalTrials.gov identifier: NCT03349333). Enrolled patients had PTCL (World Health Organization disease classification ), which included PTCL NOS, AITL, ALCL (anaplastic lymphoma kinase [ALK] + or −), ENKTL nasal type, EATL, hepatosplenic T-cell lymphoma, subcutaneous panniculitis-like T-cell lymphoma, ATL (human T-cell leukemia virus +), aggressive NK-cell leukemia, and transformed mycoses fungoides disease subtypes, which were confirmed by central pathology review. In addition, patients had disease progression after one or more prior systemic therapy and an enlarged lymph node or extranodal mass (> 1.5 cm). Patients were also required to have Eastern Cooperative Oncology Group Performance Status (ECOG PS) ≤ 2, no brain metastases, and adequate hematological, renal, and hepatic function (absolute neutrophil count ≥ 1000/µl; platelet count ≥ 100,000/µl; total bilirubin ≤ 1.5 mg/dl; aspartate aminotransferase and alanine aminotransferase ≤ 2.5 × upper limit of normal [ULN, or < 5 × ULN if hepatic involvement with lymphoma], and creatinine clearance ≥ 50 ml/min [or creatinine ≤ 1.5 mg/dl]). Exclusion criteria included use of investigational drugs or biologics within 4 weeks of study start, prior allogenic hematopoietic stem cell transplantation (or autologous hematopoietic stem cell transplantation ≤ 100 days of study start), and congestive heart failure, uncontrolled infection, unstable cardiac disease, or other serious illness deemed to impair adherence to study treatment. Eligible patients received pralatrexate 30 mg/m2 intravenously (IV) administered weekly in 7-week cycles (6 weeks on treatment, 1 week off treatment), along with vitamin B12 (intramuscularly (IM), administered every 8–10 weeks) and folic acid (orally (PO), 1.2 mg/day), which were initiated ≥ 10 days prior to study treatment. Pralatrexate was continued for 24 months or until disease progression, treatment intolerance, investigator decision, or withdrawal of consent, and a safety follow-up was conducted for 24 months following the last dose of study medication. Dose reductions and interruptions were permitted for adverse events (AEs). 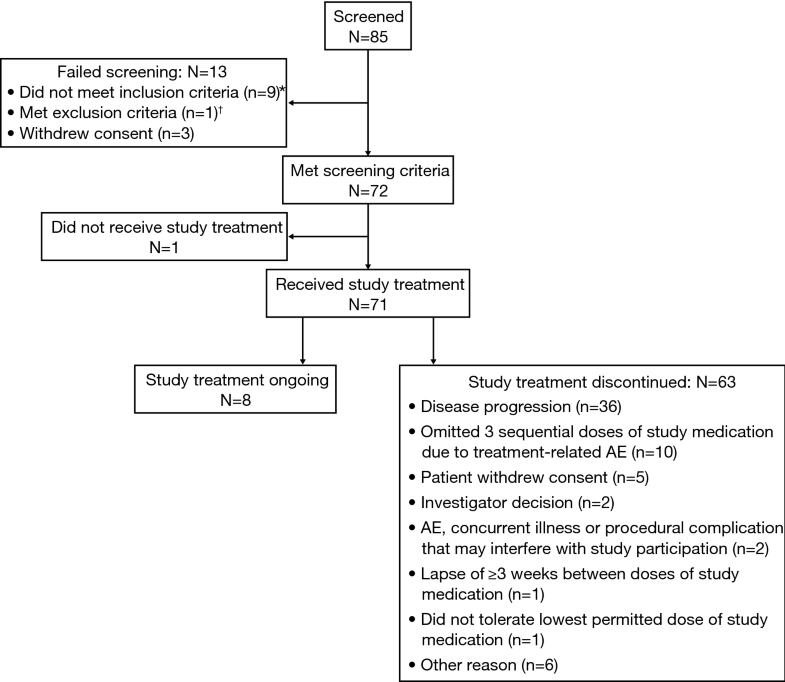 However, patients were discontinued from the study if three or more sequential doses of pralatrexate were omitted due to treatment-related AEs or if there was a ≥ 3-week lapse between pralatrexate doses. Supportive-care medications were permitted during the study, including antiemetic therapy and hematopoietic growth factors (excluding pegfilgrastim). Additional therapies for T-cell lymphoma including radiotherapy, cytotoxic or biologic agents, and immunomodulators were not permitted. The study protocol was approved by the Ethics Committees at each institution, and the study was conducted in accordance with the Declaration of Helsinki, International Conference on Harmonization Guidelines for Good Clinical Practice and China Good Clinical Practice guidelines. All patients provided written informed consent. The primary endpoint was ORR, assessed per International Working Criteria , and defined as the proportion of patients achieving complete response (CR), unconfirmed complete response (CRu), or partial response (PR) as their best overall response per central, independent review. Radiological response was assessed ≤ 7 days prior to the first dose in Cycles 2–4, alternate cycles thereafter, and when disease progression was suspected (investigator-assessed response was a supportive analysis). Pre-specified subgroup analyses of ORR included age, gender, PTCL subtype per investigator review, best response to any prior treatment for PTCL, best response to most recent prior treatment for PTCL, number of prior systemic regimens, time from most recent therapy, and baseline LDH level. Post hoc subgroup analyses included the PCTL subgroup from the central review and prior CHOP (cyclophosphamide, doxorubicin, vincristine, prednisone) exposure. Secondary endpoints included duration of response (DoR), time to response (TTR), progression-free survival (PFS), and overall survival (OS). Safety was assessed by regular monitoring of AEs (National Cancer Institute Common Terminology Criteria for AEs [NCI CTCAE] version 4.03), hematology, blood chemistry, and vital signs. Pharmacokinetic parameters, including area under the concentration-time curve (AUC), maximum concentration (Cmax), clearance, half-life (t1/2), and volume of distribution, were also assessed in a subset of patients (n = 15) using blood samples collected during Cycle 1 (doses 1 and 6: prior to pralatrexate injection and 3, 5, 8, 12, 18, 24, 48, and 72 h post injection; doses 2–5: pre-injection). The two diastereomers of pralatrexate, S-pralatrexate and R-pralatrexate, were assessed at each timepoint using a validated liquid chromatography/mass spectrometry method. The primary objective was to demonstrate an ORR ≥ 15% and was tested using the exact binomial test for single proportion at a two-sided significance level of 5%. Assuming a true response rate of 29%, 68 patients would be required to provide 80% power. Safety, pharmacokinetic, and TTR data were summarized using descriptive statistics, while PFS and OS were analyzed using Kaplan-Meier methodology. Pharmacokinetics were assessed using a noncompartmental method (Phoenix, WinNonline version 7). The primary and secondary endpoints were assessed in the safety population (all patients who received one or more doses of pralatrexate). Seventy-one patients received study medication, and treatment was ongoing in eight individuals at data cut-off (21 July 2017). Of the 63 patients who discontinued pralatrexate, most were due to disease progression (n = 36, 57%) and only n = 2 (3%) discontinued due to AEs, concurrent illness, or a procedural complication (Fig. 1). Baseline demographic and disease characteristics are summarized in Table 1. All patients were Asian, the majority were male (n = 47, 66%), median (range) age was 56 (22–77) years, and most (n = 49, 69%) had an ECOG performance status of 1 (4 patients [6%] had ECOG PS 2). The median (range) duration of PTCL was 1.3 (0.1, 10.8) years, with PTCL NOS (n = 34, 48%) and AITL (n = 20, 28%) being the most common disease subtypes. Patients had received a median (range) of 2 (1–14) prior systemic treatments, most commonly chemotherapy (n = 71, 100%), radiotherapy (n = 16, 23%), and autologous stem cell transplantation (n = 7, 10%). Examples of prior chemotherapy include CHOP, CHOP plus other agents (e.g., CHOPE [CHOP plus etoposide]-based regimens and CHOP plus ifosfamide, methoxtrexate, mitoxantrone, and prednisone), and non-CHOP regimens (e.g., CEOP [cyclophosphamide, epirubicin, vincristine, and prednisone] and CDOP [cyclophosphamide, doxorubicin, vincristine, and prednisone]). The primary objective of this study was met: ORR was 52% (95% CI 40–64) in the safety population per central review, p < 0.001. The 37 responders comprised six patients with CR (9%), eight with CRu (11%), and 23 with PR (32%). Prespecified subgroup analyses indicated that responses to pralatrexate were observed across a range of patient characteristics including PTCL subtype, response to prior treatment, and number of prior systemic regimens (Fig. 2; some subgroups included limited numbers of patients). Based on central review, median DoR was 8.7 months (95% CI 3.3–14.1) and median (range) TTR was 1.5 (1.3–8.0) months, with first response occurring in Cycle 1 for 84% of responders. Median PFS was 4.8 months (95% CI 3.1–8.1; Fig. 3a) and the estimated 6-month PFS rate was 46% (95% CI 33–57). Median OS was 18.0 months (95% CI 10.4–NA; Fig. 3b) and estimated 12-month OS rate was 57% (95% CI 44–69). Efficacy outcomes (response, ORR, DoR, TTR, and PFS) assessed per central review and investigator assessment were comparable. Patients received a median (range) of 11 (1–73) infusions of pralatrexate and the median (range) duration of treatment was 12 (1–79) weeks. The median (range) relative dose intensity of pralatrexate was 84% (42–106). Thirty-three (46%) patients experienced dose reductions, most commonly due to mucositis (n = 24) and treatment-related non-hematologic toxicity (n = 7), while treatment interruptions were reported in 58 patients (82%), largely due to mucositis (n = 43) and treatment-related hematologic toxicity (n = 31; patients may have interrupted/discontinued/reduced the dose of study treatment for more than one reason). Table 2 shows the most frequently reported treatment-emergent AEs (any Grade). Grade ≥ 3 treatment-emergent AEs were reported in 57 (80%) patients, the most frequent being anemia (24%), platelet count decrease (24%), thrombocytopenia (20%), white blood cell count decreased (20%), stomatitis (20%), and neutropenia (18%). Serious adverse events (SAEs) were reported in 35 patients (49%), with platelet count decreased (14%), lung infection (10%), thrombocytopenia (6%), pneumonia (6%), febrile neutropenia (4%), and stomatitis (4%) being reported in ≥ 3 patients. Three patients had treatment-emergent fatal AEs: febrile neutropenia, lung infection, and septic shock; these events were considered related to pralatrexate. Pharmacokinetic parameters are summarized in Table 3 (one patient was excluded at Cycle 1 Day 1 and another patient was excluded at Cycle 1 Week 6, both due to abnormally high concentrations of pralatrexate-S and pralatrexate-R considered to be physiologically unlikely). Exposure of pralatrexate-R was approximately twofold greater than that of pralatrexate-S (Cycle 1, Day 1 area under the concentration-time curve [AUC] from time 0 extrapolated to infinity [AUC0-inf] 3,313 vs. 1,675 h*ng/ml) with elimination of pralatrexate-S being approximately twofold greater than that of pralatrexate-R (Cycle 1 Day 1 mean clearance 37 vs. 18 L/h). Mean maximum observed concentration (Cmax), AUC, and clearance at Week 6 were broadly comparable to Day 1 for each diasteromer, while terminal half-life (t1/2) at Week 6 appeared to be greater than observed at Day 1, particularly with respect to pralatrexate-S. However, clinically relevant accumulation of pralatrexate following six once-weekly doses was not apparent based on geometric mean ratios (90% CI) of AUC from time 0 to last quantifiable concentration (AUClast; n = 7: pralatrexate-S 94% [63–141]; pralatrexate-R 98% [76–126], and Cmax (n = 7: pralatrexate-S 97% [40–236]; pralatrexate-R 95% [52–175]). PTCL comprises numerous subtypes of mature T-cell and natural killer-cell cancers that have varying prognoses and differ in frequency between populations [2, 4, 25]. Consequently, investigation of the efficacy and safety of treatments for PTCL in different populations is warranted. To our knowledge, this is the first study to investigate pralatrexate specifically in Chinese patients with relapsed/refractory PTCL. At the FDA-approved dose of 30 mg/m2 administered once weekly on a 6-weeks-on/1-week-off schedule, pralatrexate was associated with rapid and durable responses in the 71 Chinese patients with relapsed/refractory PTCL evaluated in this single-arm, open-label, multicenter study. Objective responses were observed in 52% (95% CI 40–64) of patients, the majority of which (84%) occurred during Cycle 1 and lasted for a median (95% CI) of 8.7 (3.3–14.1) months. Descriptive subgroup analyses of ORR indicated pralatrexate is likely to be efficacious across a broad range of Chinese patients with PTCL, including individuals who are heavily pre-treated (ORR ≥ 43% was reported in patients who had received ≥ 3 [n = 31] prior systemic regimens), or did not respond to any prior treatment for PTCL (ORR 50% in non-responders to any prior treatments [n = 26]). Furthermore, responses (ORR ≥ 50%) were also seen across each of the PTCL disease types analyzed (≥ 5 patients): PTCL NOS (n = 34), AITL (n = 20), ALK-negative ALCL (n = 6) as well as ENKTL nasal type (n = 5), which was not included in the prior studies of pralatrexate conducted in Western and Japanese patients [21, 22]. Additional studies are required to validate these findings due the limited number of patients in some subgroups. The ORR of 52% observed in this study was higher than previously reported with pralatrexate in other populations with relapsed/refractory PTCL. The pivotal PROPEL study, which was conducted in predominantly White patients recruited in the USA, Canada, and Europe, reported an ORR of 29%, while an ORR of 45% was observed in the Phase I/II study of Japanese patients [21, 22]. The reason for these differing outcomes may relate in part to differences in the patient populations, including fewer prior treatments in the present study (median [range] 2 [1–14]) compared with PROPEL (3 [1, 2, 3, 4, 5, 6, 7, 8, 9, 10, 11, 12, 13]) and the Japanese Phase I/II study (3 [1, 2, 3, 4, 5, 6, 7, 8]) and PTCL subtype distribution [21, 22]. While higher response rates were observed in patients with ALK-negative ALCL (83%, n = 6 [all ALCL 75%, n = 8]) and AITL (55%, n = 20) in the present study compared with PROPEL (all ALCL 35% [n = 17]; AITL 8% [n = 13]) and the Phase I/II Japanese study (ALK-negative ALCL 50% [n = 2]; AITL 44% [n = 9]), small patient numbers limit the interpretation of these findings. Chidamide is approved by the CFDA in patients with relapsed/refractory PTCL, and as an HDAC inhibitor has a different mechanism of action to the folate analogue metabolic inhibitor pralatrexate. Studies of chidamide have reported ORRs of 28% and 39% in Phase II and real-world investigations, respectively [18, 19]. While direct comparisons cannot be made between outcomes from different studies, the higher ORR observed with pralatrexate supports the potential utility of this treatment in China. The median PFS (95% CI) of 4.8 (3.1–8.1) months and median OS of 18.0 (10.4–NA) months observed in this study are comparable with data from Japan (median PFS 4.9 months, median OS not reached) and exceed that reported in PROPEL (median PFS 3.5 months; median OS 14.5 months) [21, 22]. Median PFS observed with pralatrexate in this Chinese population is also greater than that reported with chemotherapy given at the time of PTCL first relapse or first progression (median PFS 3.7 months) . Together these data suggest that pralatrexate may prolong the OS of Asian and Western patients with relapsed/refractory PTCL, given a recent international study of 1020 patients with PTCL reported a median OS of just 5 months and 11 months after relapse or refractory disease, respectively . Pharmacokinetic analysis of pralatrexate in this group of Chinese patients was consistent with previous findings in other populations in terms of exposure and negligible accumulation, including greater exposure to pralatrexate-R compared with pralatrexate-S, and higher elimination of the S-diastereomer [22, 28]. Furthermore, no unanticipated side effects were detected in this population. The AEs reported broadly reflected those seen with pralatrexate in prior studies of other populations with relapsed/refractory PTCL [21, 22]. The most frequent Grade 3/4 AEs included myelosuppression and stomatitis, and dose interruptions/reductions were most commonly due to mucositis. Mucositis is a common side effect of cancer therapy . Strategies to prevent and manage mucositis including oral cryotherapy, dexamethasone mouth washes, antioxidant agents, and probiotics can improve patients’ quality of life and maximize their exposure to anticancer treatments . Guidance in the prescribing information for pralatrexate includes regular monitoring for hematological toxicities and mucositis, and interrupting treatment or reducing the dose if required . In summary, this single-arm, multicenter study met its primary objective. 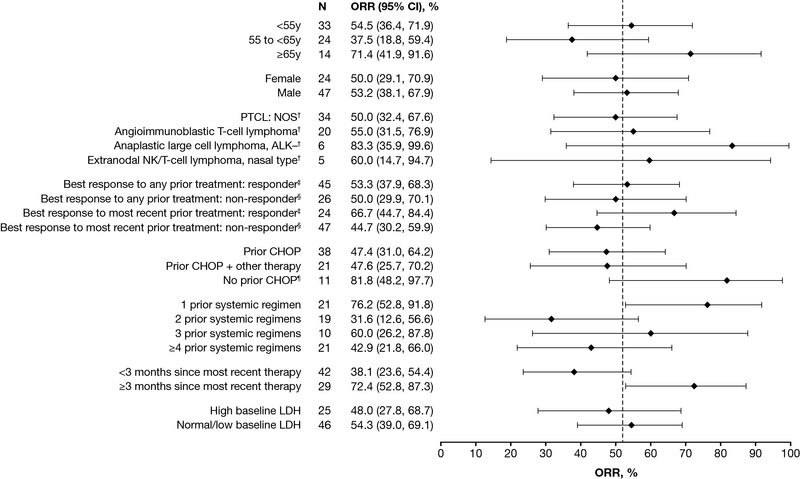 The ORR of 52% compared favorably with prior studies of pralatrexate in Japanese and Western populations and with that reported for other treatments, with responses being observed across a range of patient subgroups, including heavily pretreated individuals and those who did not respond to prior therapies. Pralatrexate was also associated with a manageable safety profile. Based on these data, pralatrexate may represent a promising treatment option for Chinese patients with relapsed/refractory PTCL. The authors thank the patients and their families who participated in this study as well as the investigators and other study personnel involved in this investigation. Medical writing support was provided by Siân Marshall Ph.D. of SIANTIFIX Ltd, Cambridgeshire, UK, and was funded by Mundipharma Research Ltd.
YS, XH, HH, BB, HZ, XK, YS, and JZ enrolled patients into the study. YS, XH, HH, BB, HZ, XK, YS, and JZ also contributed to the protocol design. YS and JZ interpreted the data. SL performed the statistical analyses, CC was the clinical lead for the study, and GL was the clinical study manager. All authors participated in the writing and/or critical review of the manuscript and agreed on the final version. This study was funded by Mundipharma (China) Pharmaceutical Co., Ltd. Open Access publication of this article was funded by Mundipharma (China) Pharmaceutical Co., Ltd.
Stefan Liebscher was an employee of Mundipharma Research GmbH at the time the study was conducted. Guodong Lu and Chunxiao Cai are employees of Mundipharma (China) Pharmaceutical Co., Ltd. Xiaonan Hong, Yuqin Song, Huiqiang Huang, Bing Bai, Huilai Zhang, Xiaoyan Ke, Yuankai Shi, and Jun Zhu declare that they have no conflicts of interest that might be relevant to the contents of this manuscript. National Comprehensive Cancer Network (2018) NCCN clinical practice guidelines: T-cell lymphomas (version 4.2018). 2018. https://www.nccn.org/professionals/physician_gls/default.aspx. Accessed July 2018. Allos Therapeutics Inc. Folotyn prescribing information. 2016. http://www.folotyn.com/HCP/downloads/folotyn-pi_Nov2016.pdf. Accessed July 2018.